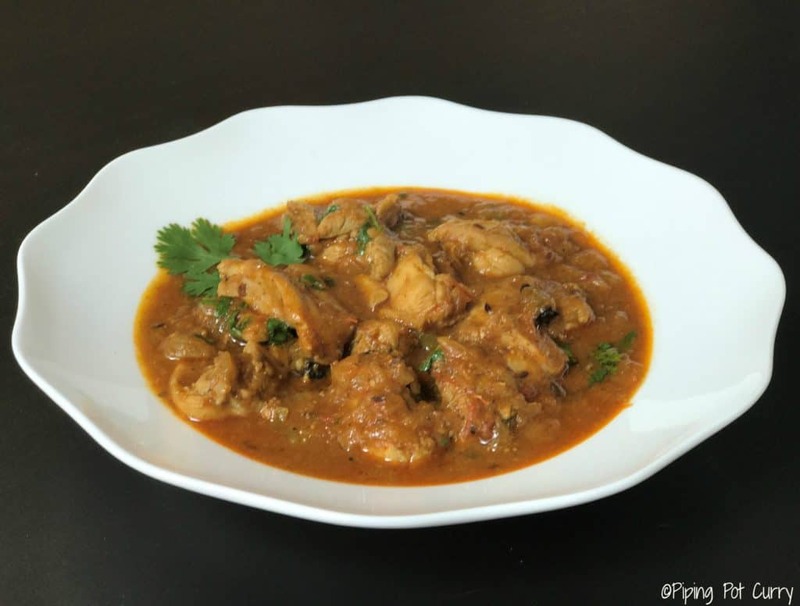 Mom’s authentic Chicken Curry recipe made in Instant Pot or Pressure Cooker. 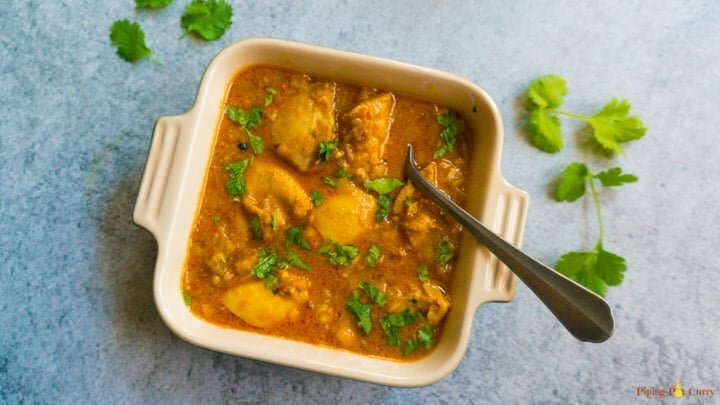 This chicken curry instant pot recipe is made in a simple onion-tomato gravy with the aroma of whole spices. This is the best Chicken Curry you will ever have! 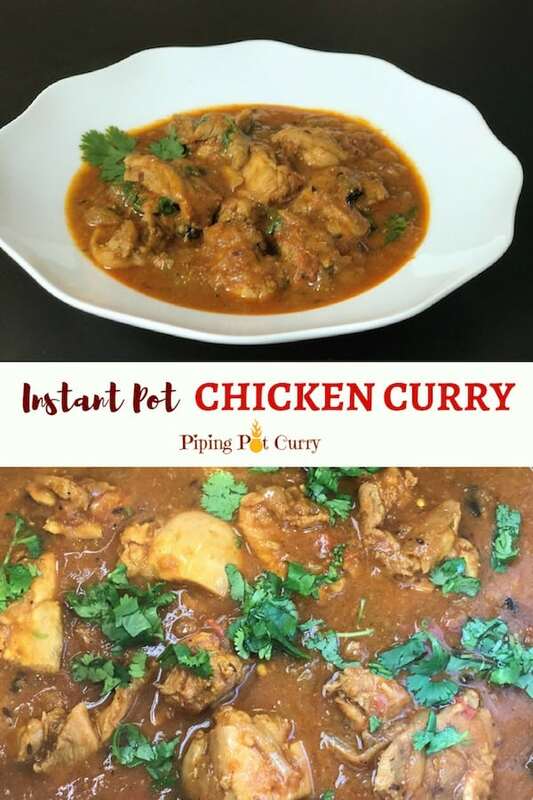 I wanted to recreate my mom’s chicken curry in the instant pot and tried it multiple times. But I was not getting the exact favor that comes when she cooks the curry….something was missing! But guess what, mom is visiting and shared her secret tips for the chicken curry. Sauté the onions for longer, about 4 mins until the oil starts separating . Add the tomatoes and sauté the onion-tomato mixture for longer, again about 4 mins until the oil separates. Add the chicken and cook it on sauté for 2-3 mins, before you pressure cook. 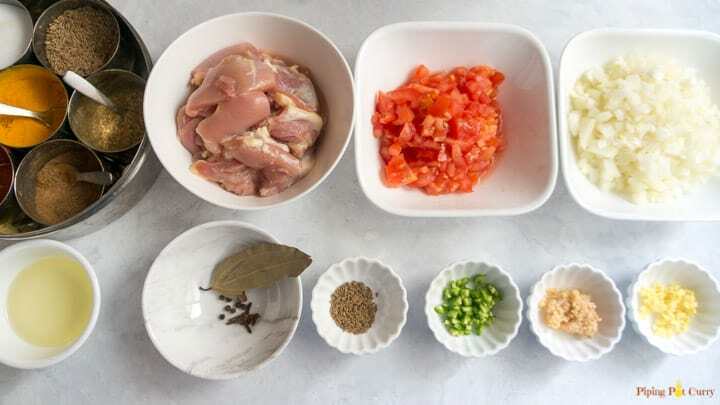 You get the idea, basically sauté the ingredients perfectly, to get the perfect chicken curry. Another great thing about this curry is, there is no marination required. 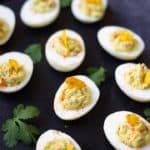 So no pre-prep for this recipe. Start with getting the main ingredients ready. The whole spices in one bowl. If you want to make this recipe simpler, you can skip the whole spices. What you lose with that is the aroma, but trust me, it will still be as flavorful. The ground spices in one bowl. Chicken cut into pieces. I used boneless chicken breasts in this recipe, but mom says bone-in chicken tastes even better. This is next to try, but I do like the convenience of boneless chicken. Now we are ready to start cooking! Start the instant pot in Sauté mode, and heat ghee or oil in it. 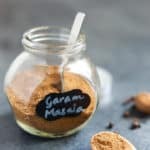 I prefer ghee to get the richer taste, especially homemade ghee in the instant pot. Add the whole spices and sauté for 30 seconds to get the aroma. Add the green chili, onions, ginger and garlic to the pot. Sauté for about 4 minutes until the onions turn brown and the oil separates. Now add the tomatoes and ground spices. Sauté for another 4 minutes until oil separates. Remember mom’s tips, this sautéing of onions and tomatoes is what gives a great taste to the chicken curry. Keep stirring at about 1-2 minute interval, so the onions and tomato don’t get stuck to the bottom of the pot. Let’s add the chicken pieces to the pot. Stir it well, so the chicken is coated with the onion-tomato masala. Sauté the chicken for a couple of minutes. Now add half cup of water to the pot. The trick is to add less water, as the chicken also releases water. 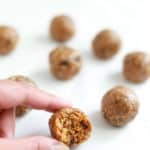 Change the instant pot setting to manual mode and cook for 5 minutes on high pressure. Quick release the pressure, as we don’t want to overcook the chicken. Stir in the lemon juice and garnish with cilantro. Look at the end result, doesn’t it look appetizing? I had this chicken curry for three meals at a stretch, first with roti (Indian flatbread), then with rice and finally with naan. 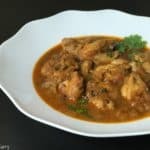 Try this Chicken Curry instant pot recipe and let me know how you like it. Mom’s authentic Chicken Curry made in a simple onion-tomato gravy with the aroma of whole spices. Cut the boneless chicken into small pieces, about 1-2 inch in size. Heat the instant pot in Sauté mode and add oil to it. Add the whole spices and sauté for 30 seconds to get the aroma. Add the chopped green chili, onions, ginger and garlic to the pot and sauté for 4 minutes until they turn golden brown. Keep stirring at regular intervals. Add the chopped tomatoes and spices. Sauté for another 4 minutes, while stirring at regular intervals. Add the chicken and sauté for 2 minutes. Then add the water and stir it with the chicken. Deglaze and scrape off anything stuck to the bottom of the pot. Change the instant pot setting to manual/pressure cook mode on high for 5 minutes. When the instant pot beeps, quick release the pressure manually. Stir in the lemon juice. Garnish with cilantro and chicken curry is ready to serve. If you want to simplify this recipe, skip the whole spices in this recipe. To make this less spicy, you can skip the green chili. If using bigger pieces of chicken, increase the pressure cooking time to 7 minutes. I used chicken breasts when making this curry, but chicken thighs would work great too. 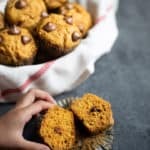 This recipe was created in a 6qt Instant Pot DUO60 Multi-use Programmable Pressure Cooker. 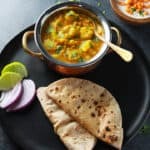 If you are looking for more chicken recipes, check out Chicken Korma, Keema Matar, Chicken Chettinad, Saag Chicken and the famous Butter Chicken. Like goat meat, check out our Mutton Curry recipe. 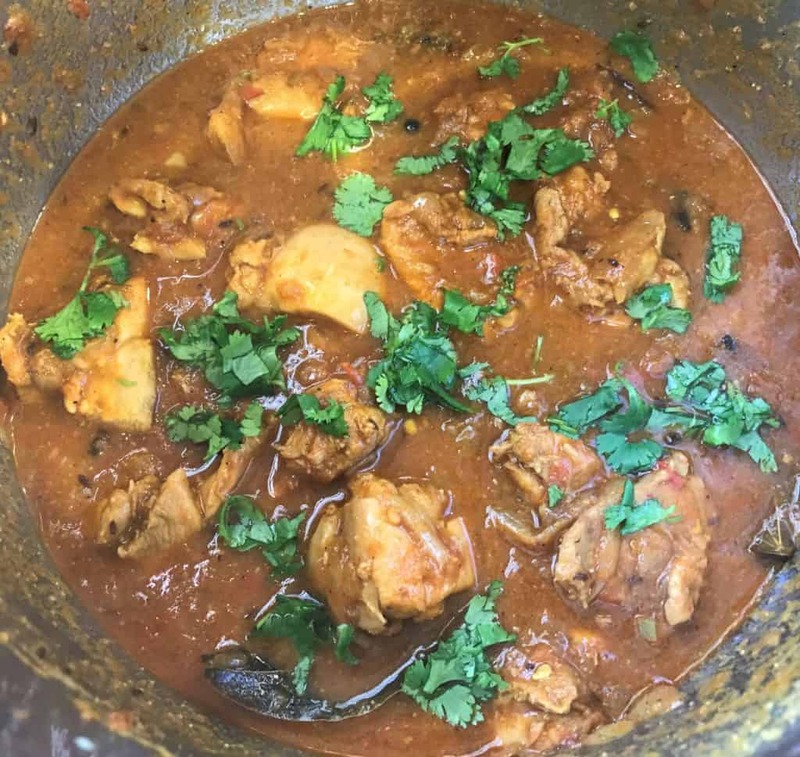 Hi Ramesh – so glad to hear you enjoyed the chicken curry and other recipes. Thank you for sharing back your review!